A report issued by Abaad Studies and Research Centre on the early presidential elections has said that among the most important demands of the new president Abdo Rabo Mansour Hadi was the reduction of unemployment, providing job opportunities and prosecution of those officials accused of killing their fellow protesters as well as creation of a new civil sate. The report that depended on a survey carried out by a team of the square youth camped in front of Sana’a University pointed out that reconstruction of the military, the southern case , the violence groups including the Houghi group , the armed southern movement, Al-Qaeda and remnants of the former president, Ali Abdullsh Saleh, pose challenges for Hadi in the transition stage. “Armed manifestations widespread in some cities and towns, violence acts, chaos provoked by some groups with support of some leaders loyal to the former regime as well as insecurity were among challenges ” the report added. According to the reprot, the demands expected by the new president differentiate from a province to another on base of needs and conditions of people. “The end of unemployment, providing youth with job opportunities, eliminating poverty, oppression and corruption, and improving of education were among the demands of the youth” it concluded. Most the square youth of Sana’a, Hadhramout and Aden viewed Hadi as closer to the revolution than the regime, pointing out that he agreed to be the candidate despite his knowledge of pending risks. “While the youth of Al-Baidha said Hadi stand at the mid-point between the regime and the revolutionaries, the youth of Ibb said Hadi is close to the former regime, pointing out that he was an assistant of Saleh. They further accused him of involvement in the marginalization decisions taken by Saleh against his opponents. They indicated that Hadi did not direct to end violence acts committed by the Republican Guard in Arhab, Nihm, Bani Jarmooz , Alhasaba and Sufan. “Many youth were worried about the regional and international moves on the internal affairs , pointing out that these countries merely seek to secure their interests, international security and counterterrorism. The report said that the presidential elections revealed that the popularity of the four violence movements deteriorated, pointing out to the rising of political parties. “Al-Qaeda, Al-Houthi group, the armed separatist movement and the groups affiliated with the former regime failed to break down the early presidential elections generally, but it impeded the process in some areas” it went on. It pointed out that the use of the Houthi and the separatist movement to boycott the elections and use weapons and violence against civilians undermined the popular sympathy with their issues and disclosed that they enjoy low popularity. The report affirmed that the reaction of the change square youth in the elections exceeded all expectations. That may lead to a rupture between the youth and those groups that used violence in the elections because the election is the first factor to achieve the objectives of the youth. “They viewed the election as the essential turning point that ousted the former president Ali Abdullah Saleh and creation of the civil state,” the report said. The report cited that Aden witnessed violence acts by a movement calling for separation, using heavy and light weapons. “Some security men withdraw from four polling centers under the pretext of non receiving their financial allowance. Soldiers and figures affiliated with armed groups of the Southern Movement prevented the people from accessing to the polling stations as it was happened in the centre c of the constituency 27 and another center of the constituency 22. The observation teams were attacked in a centre of the constituency 23.” It affirmed. In Shabwa, according to the report, armed groups of the Southern Movement prevented the election process in 44 out 199 centers. Hadharmout, as the report says, witnessed low turnout as a result of threats of the armed groups affiliated with the Southern Movement that thwarted three centers in Al-Mukla and one centre in Saioon. A military commander loyal to Saleh impeded the vote counting in the constituency of Al-Horah. It said the armed movement hindered tow centers of the constituency 124 in Mukairas of Al-Baidha nearby Abyan in which armed groups obstructed the electoral process in two constituencies of Rasd and Sarar. “People of three constituencies, Al-Mahfad, Jaishan and Ahwar, accused the elections committees of involving in hindering the electoral process and not brining the ballot boxes under the pretext of security concerns” the report added. According to Abaad, Al-Qaeda was behind the impediment of the election of two consistencies in Jaar and Zinjibar of Abyan. The electoral process happened only in three constituencies; Loader Modia and Al-Wodaia of Abyan. ” Al-Qaeda halted the election in the constituency 131 of Rada of Al-Baidha governorate and the election committees preferred to not dispatch the election team to Al-Manaseh areas, the birthplace of Tareq Al-Dhahab, Al-Qaeda leader who was killed weeks after his followers had captured Al-Ameeria of Rada’a. Abaad report said the Houthis halted the election in many centers of Saada, Hajja and Amran. The areas controlled by the Houthi group witnessed chaos and threats against the voters and activists. “The Houthi group halted the election in three centers in Harf Sufian of Amran governorate, three centers in Mastaba of Hajja and 37 centers of Saada” the report affirmed. According to the report, the Hothi group captured about 22 activists and members of the opposition. Eight of them were released. There were information that a number of voters were captured too. The report affirmed that the most senior security official of Shada district involved in preventing the people from voting. 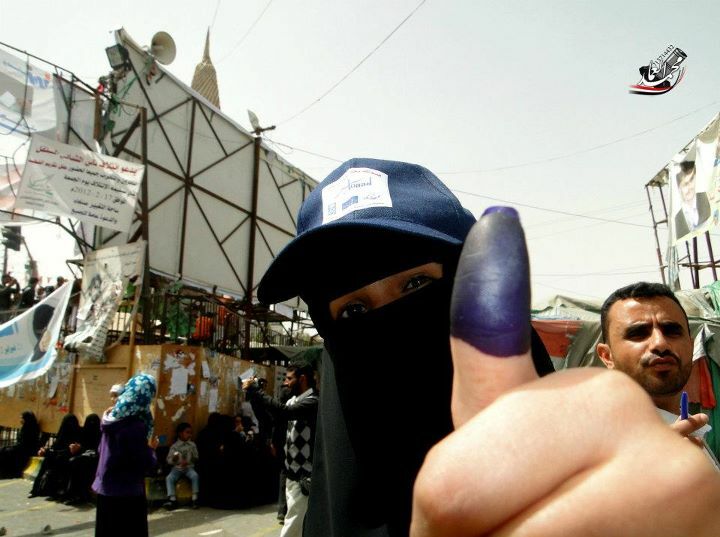 Houthis further tore the election card as happened in a centre of the constituency 269. Houthis wrote down names of voters, and in some centers they were photographed and threatened of punishment after the election.